Excellent book. Michael Goldfarb records how most of the advances toward modern governments in Europe were often started with the discussion of whether or not to emancipate the Jews. Once released from the ghettos the brains and talent came out and produced stars in every field--Einstein, Freud, Mahler, etc. So much history in 367 pages yet It was thorough and so very readable. Interesting was that once made a citizen, a Jew in France was a Frenchman. In Germany even with rights amid citizenship, a Jew was never a German. I got a clearer understanding of why they didn't leave when Hitler took over. They remembered the many setbacks along the way and looked at the Nazis as another temporary setback. I really like this book! It reintroduced me to French history, then clearly expanded my awareness into Germany and beyond. I am very impressed with Goldfarb's ability to remain clear and not confuse the players, the political positions, the development of religious expressions, music & poetry, science, and journalism. Fascinating. It sounds a little overwhelming, but topic by topic, and using key individuals and historic events, I'm left with a much richer sense of what tolerance and acceptance means for the growth of societies and how easily it's eroded. Excellent writing. A rich historical narrative that is highly recommended. Encompasses European history and story of European jews emancipation from late eighteenth century to early twentieth one. As a kid from te late 80s, I have no experience with antisemitism. Most of what I know is from WWII or American tv shows. This book shows me some of that history. It shows the restrictions and prejudices that existed, the fights that were fought and the beginning of their emancipation. I now understand far better how nazi Germany could have demonized the Jews, that they were the last in a long history of repression. It showed me a side of Europe and religious history that I hereto was only barely aware of. It was very informative and not that difficult to read. There are only two choices Goldfarb made that I might disagree with.The first is his focus on important men. The history of jewish emancipation is told almost exclusively through the histories of great men like Spinoza, Hess, Heine and Einstein, to name but a few. I enjoyed reading about these people and their lives, but I also would have liked to read more social history. To read more about the Jews in Europe as a people, their circumstances and the changes in their lives. Not just through a few exceptional individuals. That information is there in this book, for the most part, but it is a mere sidenote. When some bigshot goes to the getto and comes back a changed man, that's when we hear about conditions in the getto, otherwise we don't. I would have liked to see more. Also, this focus on individuals causes the book to loose some of its cohesion and structure.My second peevee is the period Goldfarb has chosen. I don't understand why he chose these points to begin and end his book. Why did he stop before WWII? Why didn't he give a broader overview of the situation at the beginning of his chosen period and some more backstory into how that situation had arisen? 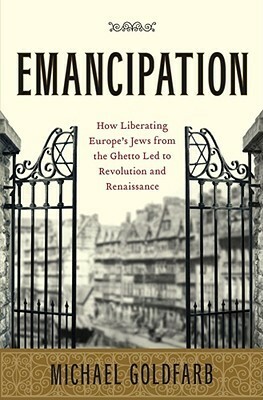 This is a readable history of European Jewish emancipation—both legally as citizens and culturally as writers, thinkers and doers. It draws on many of the right secondary sources and shapes what has always struck me as a confusing patchwork of national histories into a manageable narrative; I found myself learning something new in every chapter. Tracing Jewish life from its most restrictive to its flowering in the 20th century, Goldfarb uses major figures as markers for the big turns in history. He shows how debates over the Jews’ legal status were triggers for the liberalization of the European state. From the French Revolution on Jews and their (mis)fortunes appear, Zelig-like on the scene. The framing of a French Jewish military officer in the Dreyfus Affair threads through the last half of the book. There are welcomed portraits of the usual suspects—Mendelssohn, Marx, Freud—as well as neglected revolutionaries like Maimon, Hess and Borne, composer Mahler and the writer Schnitzler. Hard to believe.....but here's a 19th century European history book that's so riveting I couldn't put it down. Beautifully written by a journalist who summarizes and simplifies the historical context so that his theme...the amazing story of how Europe's Jews went from being locked out of society in ghettos (literally) to being the heart and soul of European intellectual history within a century. From the French Revolution to the rise of Hitler in 1933, the authors dovetails the stories of individual lives into a remarkable tapestry. Brings the key players and acts of this critical period in Jewish and European history to life. Each chapter focuses on a particular individual or group of characters, with key events in their lives described as might be found in a novel or perhaps a feature article. This was a most interesting and enlightening read, which makes me surprised that Goldfarb is not better known. For me there is no comparison between this and Schama's "the story of the the Jews" for example with which I am ingesting no learning of note and am struggling to complete. Anyone who reads popular history knows that there is sometimes a fine line between popular and superficial. In Emancipation, Goldfarb has produced an amazing example of the best kind of popular history. It is eminently readable, well-researched, and covers a lot of ground without ever seeming to be just skimming over the surface. As with other great history works, it inspires you to want to go into more depth and to seek out other works on the topic. My first book to read entirely on a Kindle - many great history lessons here for me: a greater understanding of the Jewish escape from the ghettos, and bios for many fine and important German and French rabbis of the late 1700s and 1800s. Fascinating - and I'm wild about the Kindle; I had this book loaded within 7 min of hearing it reviewed on NPR. Boring. That about sums this one up for me. Textbooks are more interesting than this book. There was alot of early European history but it just wasn't that interesting. Fascinating book. So much of the period from the French Revolution to the Nazis that I did not know. Now I'm trying to figure out the theological significance of it all. Fascinating history of Western European Jewish life in the 18th and 19th centuries and how bound up their freedom was with politics and revolution. Who knew? Very good read. Informative and enlightening. An excellent read tying the threads of history together showing how we arrived where we are today. The echos continue in the middle east and in the Ukraine.